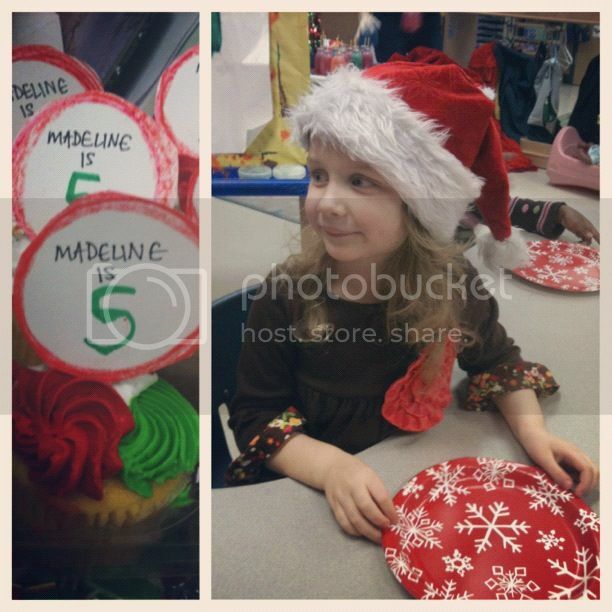 Today was the fourth and final celebration of Madeline's fifth birthday: the school party. 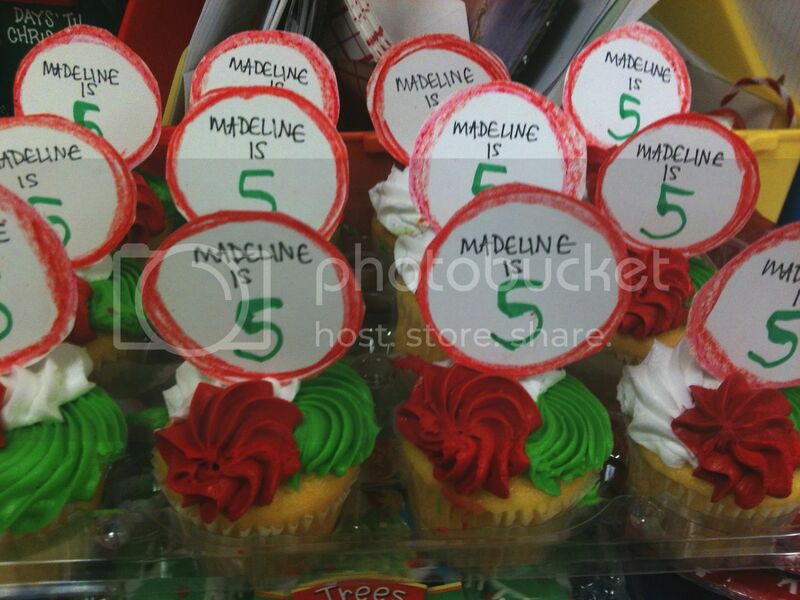 You must know that Madeline's school is militant about what kinds of foods parents are allowed to bring to a party. They pass out a supplemental nutrition form in the beginning of the year, which parents must turn in and receive approval for at least a week in advance. Foods with any amount of fat or sugar get the axe. Cupcakes and ice cream need not apply. Thanks a lot, Michelle Obama. We will be having our Christmas party on Monday, December 17. If you would like to bring something for the class, feel free to do so. This is one of the few days a year that we are allowed to have sweets. We have 10 boys and 7 girls in our class. You better believe I wrote a note to the teacher and hitched Madeline's shindig to that party faster than you can say "cupcakes." Things got interesting when, 45 minutes before I had to BE at school, I impulsively decided to make cupcake toppers. These were not just Christmas party cupcakes, these were "Celebrating Madeline Who, Five Years Ago, Was Born With Sparkle In Her Veins" cupcakes, and I could not have them getting lumped in with the Cheetos and Christmas cookies. Nevermind that I hadn't showered or eaten, and, like Sam, was still in my pajamas. Where there's a will there's a way, and I have nothing if I don't have will. I parked Sam in his high chair munching a piece of toast and watching Veggie Tales Christmas movies and got busy. I traced lumpy circles around my pepper shaker with a broken red crayon. I cut out my circles, hot glued toothpicks to the backs of them, and then tried to write on the fronts with a Crayola marker - over the toothpick bumps. So classy. A very large pregnant woman who has not showered or brushed her hair in two days and is not wearing even the tiniest smidge of makeup. She is wearing the same outfit that she has been wearing for the last two, now three, days (and this is not an exaggeration). She has shoved two containers of store-bought cupcakes sideways into a bag which is slung over her shoulder, smashing all the icing, and she is carrying a baby on one hip. The baby and the cupcakes are bumping along as she runs, panting, through the rain without an umbrella. And so - I arrived to Madeline's Christmas/Birthday party looking like a drowned rat. A very pregnant drowned rat. And when I walked in, my baby girl lit up and shouted, "MOM!!!!" In that moment I felt no shame, no embarrassment, and no regret because I chose what mattered; I chose to be there. I chose last-minute cupcake toppers over makeup. I chose being on time over being late, and I'd do it a hundred times over. This is what ultimately matters to our kids, this is what they'll remember, whether or not we were there. I am not a perfect mother, but I am a present mother, and at Madeline's class Christmas party - I was there. I would be happy if today were exactly how Madeline remembered me forever: big, tired, a total mess, but there for her - on time and with cupcakes.